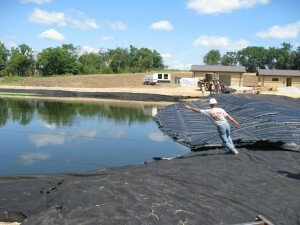 Lagoon Improvements- Donnellson, Iowa – French-Reneker-Associates, Inc. 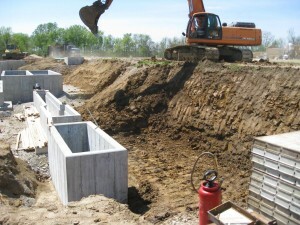 The engineering firm of French-Reneker-Associates, Inc. of Fairfield, Iowa, working with the City of Donnellson has completed a project to upgrade the City’s sewage treatment plant to meet Iowa Department of Natural Resources Standards. The project reduces the concentration of ammonia nitrogen that is discharged into an adjacent stream by 94% compared to how the lagoon system was previously performing. The project has also essentially eliminated E. coli bacteria entering the stream. Iowa’s streams are plagued with high concentrations of ammonia and bacteria which affects our drinking water, fish that live in the streams, and the use of the streams and lakes for recreation. Iowa is attempting to improve water quality through a nutrient reduction strategy. Donnellson is a small contributor of pollutants to the streams relative to all of Iowa, but they have made their contribution to the good for all. The project included upgrading the aeration system to provide more oxygen to the wastewater for better treatment throughout the year and placing an insulated cover over the lagoon to keep the wastewater warmer during the winter months. The bacteria that provide the treatment in the lagoon are more active and more effective with warmer water. The project also includes an ultraviolet light system at the end of the treatment train to rid the wastewater of E. coli bacteria. Some sewer treatment plants use chlorine to kill E. coli. Ultraviolet light is a relatively new method for disinfection. Chlorine is a dangerous chemical for the plant operator to handle. Chlorine leaves a residual chemical that is harmful to fish and other wildlife. The ultraviolet system does not leave a residual chemical and is easier and safer to be around than chlorine. Donnellson has gone a step further by also adding solar panels to reduce their power costs at the lagoon. The solar panels were installed in 2014 and are working very effectively. Most people do not think to tour a sewage treatment plant. It may not be on your bucket list, but the Donnellson plant is worth a trip if you have any interest in wastewater treatment or in water quality in general. French-Reneker-Associates was the lead design professional for the project from the initial design concept development through the completion of construction. Our initial work included meeting with the City to identify the situation and begin discussions of alternatives. Our first engineering contract was to develop a preliminary engineering report analyzing alternatives and making recommendations. The report was completed in 2008. Four alternatives were evaluated for nutrient removal and two alternatives were evaluated for disinfection. The nutrient removal alternatives considered were constructing a controlled discharge lagoon, constructing a mechanical activated sludge plant, constructing a mechanical moving bed biological reactor plant, and installing an insulated cover over the existing lagoon cells. The recommended alternative was to install the insulated cover. This alternative was the lowest initial capital cost and the lowest 20-year present worth including the operation and maintenance costs. This alternative also met the parameters of simple operation and construction within the same footprint as the existing lagoon system. The disinfection alternatives considered were ultraviolet light and chlorination/dechlorination. The recommended alternative was vertical bulb ultraviolet light. Ultraviolet light was recommended because it requires a small footprint, leaves no residual components in the discharge water, and is safer for the operator to handle than chlorine. Community Development Block Grant funds of $300,000 were acquired for the project in 2009. In 2010, a new technology treatment system was accepted by the Iowa DNR. The new technology consisted of installing a submerged attached growth reactor as a polishing reactor following the lagoon. We then provided an updated report considering this new technology along with the other alternatives for nutrient removal. The present worth analysis showed the new technology to be slightly less expensive than the covered lagoon alternative. The covered lagoon alternative was recommended because the submerged growth reactor required land acquisition or a pump station, neither of which were palatable to the City. The preliminary design of the project included evaluating the lagoon flows. 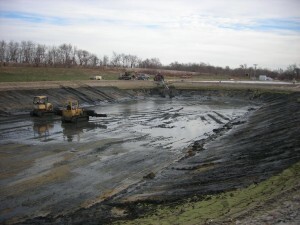 The lagoon flows were larger than the previous design flows due to inflow and infiltration. An anti-degradation analysis was therefore required. Seven alternatives were considered with the anti-degradation analysis. The seven alternatives included the five described above plus recycle/reuse and land application. It was determined that recycle/reuse and land application were not practical alternatives. The covered lagoon and the submerged attached growth alternatives were the most economical alternatives and both reduced the final effluent pollutant loading to less than the existing conditions. The recommendation was therefore to continue pursuing the covered lagoon alternative. French-Reneker then prepared final drawings and specifications and assisted with acquiring bids. The project included the lagoon cover, new concrete block headworks, blower, disinfection, and office buildings. 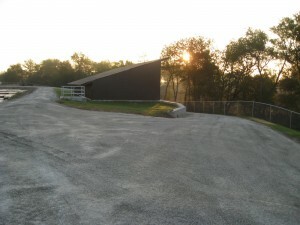 With final design completed, the estimated project construction cost was now $2,700,000. Donnellson has about 365 wastewater customers. That equals almost $7,500 per customer. The bid was set up with alternative bid items allowing the City to change from concrete block buildings to wood frame buildings. The low bid was $3,100,000 with the concrete block buildings and $3,043,000 with the wood frame buildings. The City decided to accept the low bid with the concrete block buildings. During construction, French-Reneker provided daily construction observation and engineering during construction, and followed up with record drawings and an operation and maintenance manual.